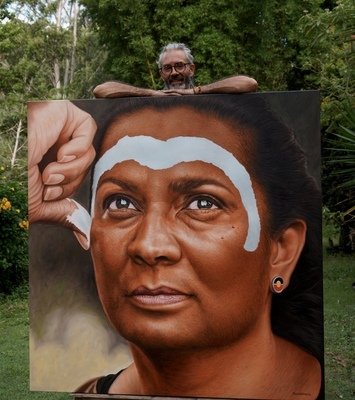 Archibald Prize entry of Nova Peris by Jandamarra Cadd. Last week renown Noosa artist Dr Jandamarra Cadd revealed his 2019 entry into the Archibald Portrait Prize amidst gasps from the crowd gathered at the newly opened Henderson Gallery in Brisbane. It was an exhibition to showcase a handful of artists’ works destined to go before the infamous Archibald panel of judges. “There was an overwhelmingly positive response to my portrait”, Jandamarra said, “I haven’t had a response to a painting like this before”. This statement means more than it may appear, as this humble artist routinely has hundreds of thousands of reactions to his paintings when he reveals them online. His large and intimate portrait this year is of Olympic Gold Medalist and former politician Nova Peris. The portrait shows a close-up image of Ms Peris’s face and another hand painting white ochre paint across her forehead. “When Nova delivered her maiden speech on her entry into Parliament, she was painted up just like this before she entered the chambers.. So I wanted to recreate a bit of that moment while also using the ochre to show her connection to her ancestors of this land,” Jandamarra said. This is Jandamarra’s eighth entry in the Archibald Prize. In 2014 he was named a finalist for his portrait of Archie Roach completed in dot work. This year’s Archibald Finalists will be announced by the Art Gallery of NSW on 2 May with the winner announced on 10 May.